The candy corn candies were my inspiration for this project. Even though I don’t care to eat them, I always thought that there was something whimsical about the colors. It reminds me of Halloween, but it’s not scary or frightening. 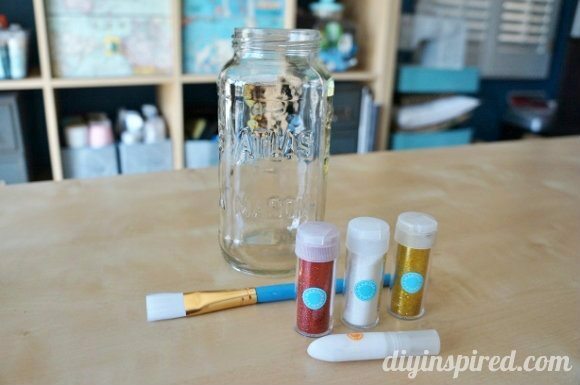 So, I decided to make a glittered candy corn Mason jar. 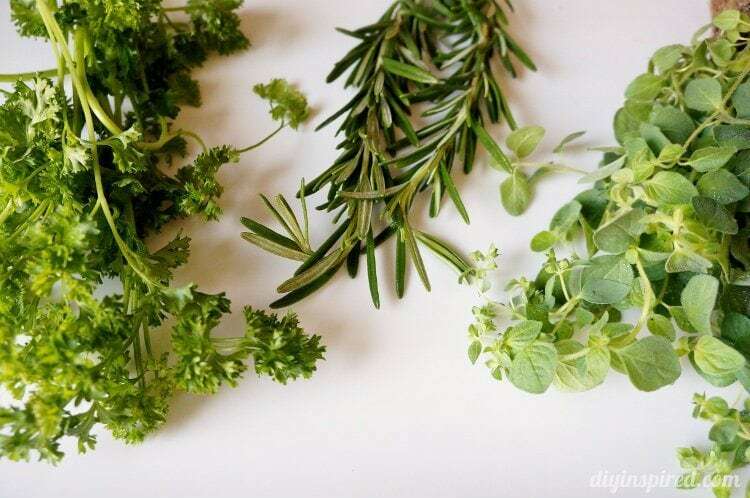 The materials list below contains affiliate links for products that I recommend for this project. I started with the center orange stripe on purpose to save time. I knew once that the orange was dry; I would be able to apply both the gold and white without waiting for one to dry. Using painter’s tape, I taped of my center stripe and then covered the entire center with glue using the paint brush. 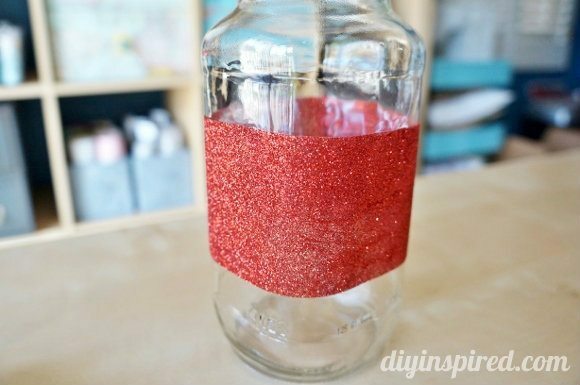 I sprinkled the glitter all the way around the jar. 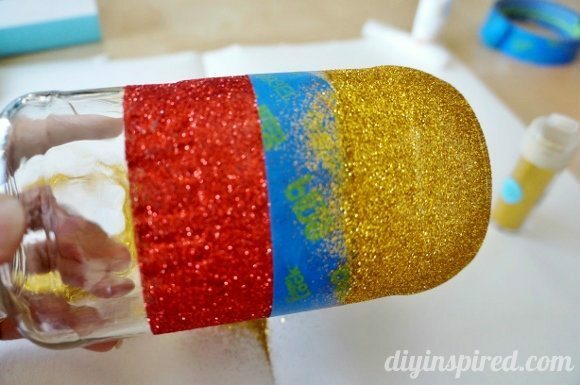 Tap off the excess glitter and put it back in your container. While the glue was still wet, I pulled off the painter’s tape. I allowed it to dry completely. Next, I taped off the lower half of the orange stripe to begin glittering the gold stripe using the same technique above. 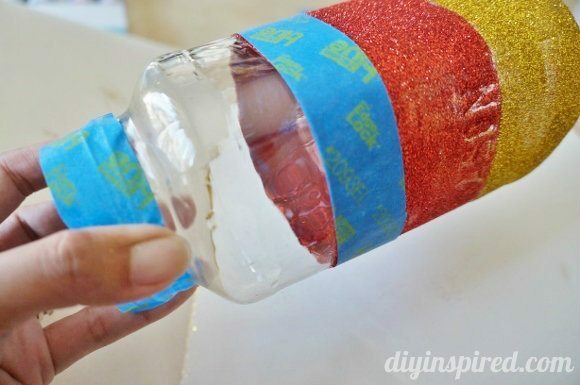 Remove the tape while it is still wet. Repeat the process for the final white stripe. 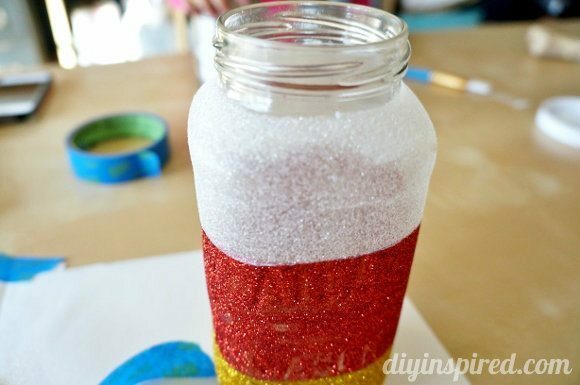 Once the glue was dry, I gave the vase a light tap over the garbage can to remove any excess glitter. Then, I added water and fresh flowers! I loved how it turned out. 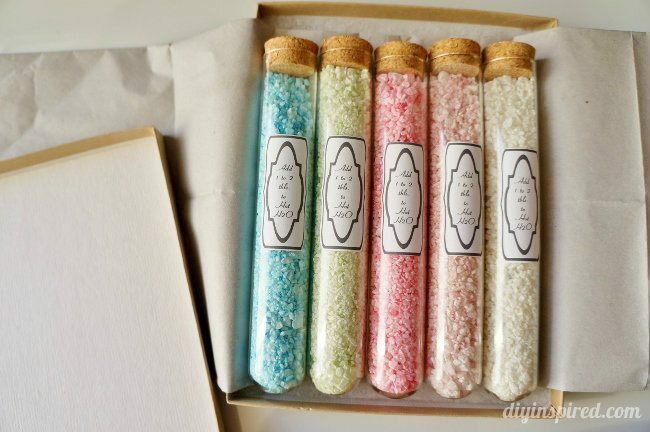 I think these would make a great homemade hostess gift during all those parties over the holidays! 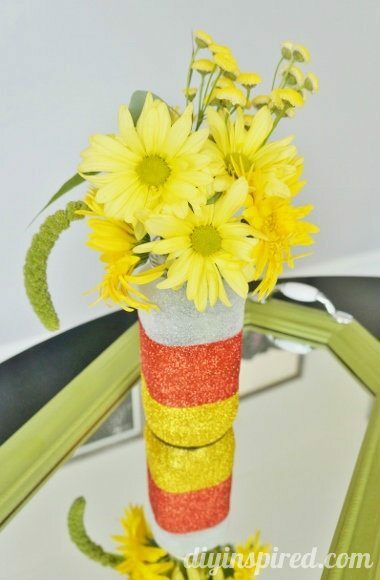 Love the Candy corn vase!!! 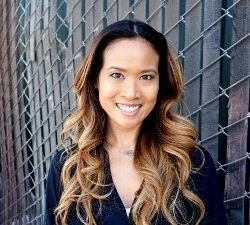 Thank you, Joann!!! I thought it turned out cute! what a fun and cute idea! I love that I could do this in just a little amount of time. I LOVE this idea! While I don’t like to eat candy corn, it certainly says Halloween better than almost any other candy. 🙂 And I save all my jars too. They are so useful! Thanks, Sharon! I don’t eat it either…WAY too sweet… but you are right, I do like it for decorations! How cute is this! SO CUTE! 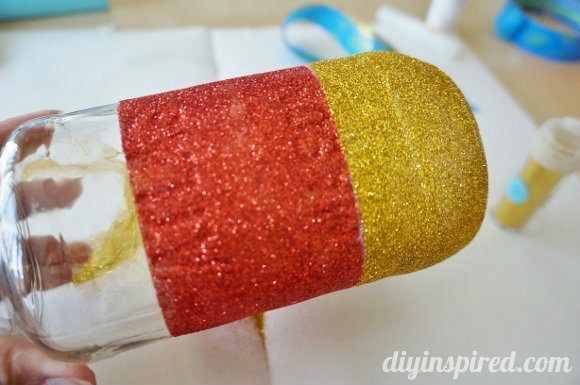 Love the glitter and that tape seems to do the trick. Pinning. 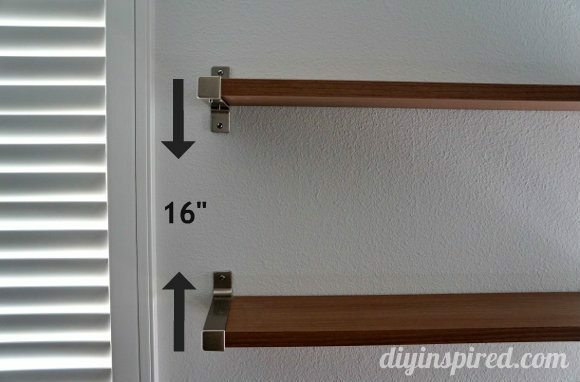 I love this, and it looks great on the mirror tray. Thanks for sharing. I’m dropping by from the Crowned Goat link party. 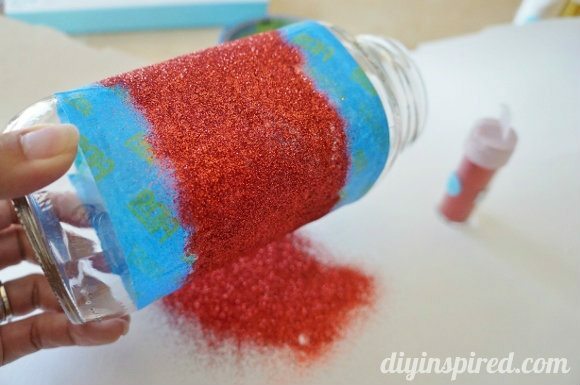 This is such a fun idea — and easy to do. I love it. Awesome, Nina! Thank you, I will check it out! This is so cute. I love the glitter, and I really love candy corn (just ate half a bag today, whoops). Hahaha!! You’re the second person who has told me that today! Thanks, Kati!! I’m with you. Don’t like to eat candy corns, but they sure are fun to decorate with. 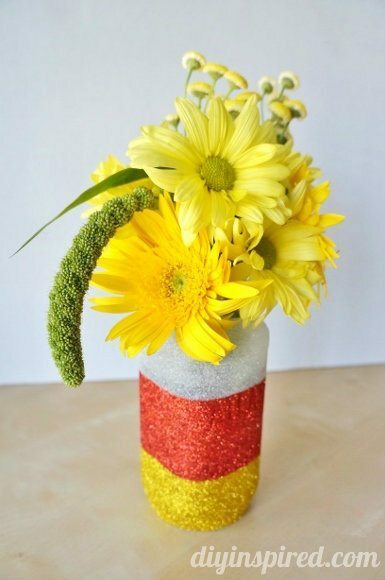 Love the vase! Thanks, Kara! Yep… not a huge fan! Love it! The candy corn pattern is one of my favorite seasonal patterns. This is just beautiful! I love it! I hate Halloween, but love candy corn. This is darling! And easy enough that I can do it! Thanks. Love this! What a great fall/halloween decor idea! Thank you for sharing at Dream. Create. Inspire. Link! I’ll be pinning your idea! Thank you so much for having me, Cat!